The ST 151 from Sigmatek expands the S-DIAS Motion series with a high-performance stepper motor output stage, which is designed to control two-phase stepper motors up to a rated voltage of 50 V DC and a continuous current of 5 A in full and half step mode. In addition, microstepping is supported with 64 micro steps per full step, whereby a highly precise and at the same time smooth running of the motor is achieved. 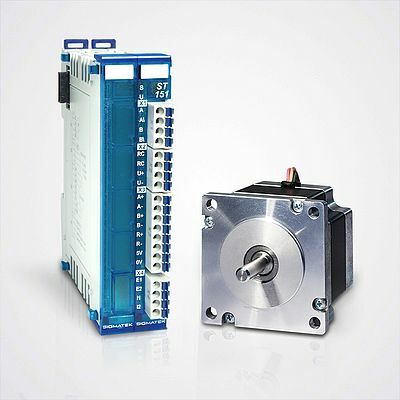 The stepper motor module in compact S-DIAS form has an incremental encoder interface for position control of the stepper motor, as well as a 2-channel enable input for implementing the Safety function Safe Torque Off (SIL 3, PL e). Using STO, the drive can be safely put in a torque-free condition when needed. Two digital inputs (+24 V DC) with a delay of 10 µs are also on board. These can be used as end switches, a position latch or for reference profiles. The parameters are set in the control application. The ST 151 can therefore be perfectly adapted to the respective motor and area of operation. In the drive library of the engineering tool LASAL, a wide selection of predefined motion components is available, so that the application is ready to use. In addition to the servo motor output stages with incremental encoder or resolver inputs, the S-DIAS Motion series includes DC motor current controllers. In combination with the Safety modules of the series encoder signals such as speed, position, direction of rotation and standstill can be safely and flexibly monitored (SIL 3, PL e).